Sveinbjörg Guðmundsdóttir translated most of the Book of Mormon into Icelandic, beginning in 1977. 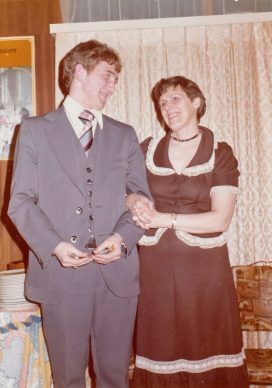 She had joined the Church in 1976 after two missionaries knocked on her door and taught her the restored gospel. 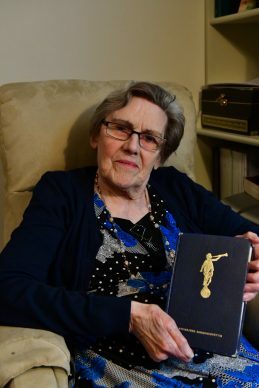 When approached by Church representatives about translating the Book of Mormon, Sveinbjörg quit her job and humbly accepted the assignment. She consulted with the Spirit as she constructed a team to help with the translation, and received powerful revelation as she guided the project and acted as translator. I became a translator for the Church in 1977. My first assignment as a translator was the Book of Mormon. In school—I have never been abroad. Did you volunteer to translate? Two men came and offered me a job as a translator. One was the translation manager in Frankfurt for the European area and Scandinavia; the other was the man over the distribution center who had something to do with the Scandinavian countries. I was then working as a secretary for the biggest firm in Iceland. I didn’t hesitate; I accepted and gave thanks in humility. I didn’t feel qualified enough at first, so that is when we tried to find other translators with the help of missionaries. With their help we found two men willing to translate. One man was working with the Icelandic dictionary. He expected it to take one to two years. He was an excellent and well-known translator and he had even translated from Sanskrit, so he was excited to translate the Book of Mormon. 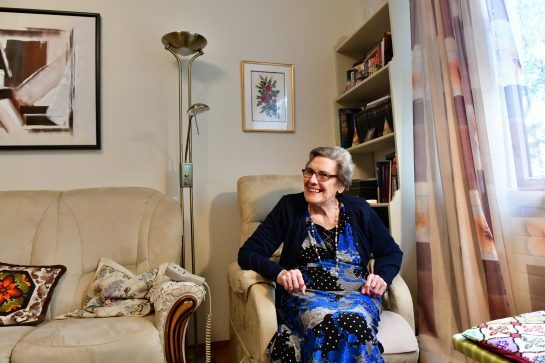 Sveinbjörg at her home in Iceland. How did you join the Church? The missionaries found me. I had my pipe in one hand and I answered the door. They talked some language and I didn’t understand it. I didn’t know what it was. It sounded a bit like Icelandic. I talked to them back in Danish, but they didn’t understand that. I then tried English and they could speak that. After all that, I had to invite them in. They told me who they were and I was excited about that. For a long time I wanted to learn about the Mormons. I had heard about Brigham Young and the walk west, and had also seen a movie about this Brigham Young and the difficulties going west and it affected me. I went to the library after the missionaries came—I don’t understand why I hadn’t done that before. I really wanted to learn. What I found at the library was all against the Mormons. I had read two pamphlets that the missionaries had let me have. When I got those books from the library I knew that what was written in the library was wrong. If I had first gone to the library before I had seen the missionaries, I probably wouldn’t have listened. The other person who wanted to help translate was a medical doctor and a great linguist, named Halldór Hanson. He was born in Iceland and raised partly in Iceland and partly in Denmark and in Germany. He studied medicine and then went to America to specialize. He had to learn English. After he finished he went to France and stayed there for 3-4 years. So, he spoke French too. Later on he learned Russian. He liked to help us with the translation, but he was a very busy man too. We had to choose which of these men to work with. That meant prayers and thinking a lot about it and praying a lot. I also talked with my supervisors to choose which man should help us. They didn’t want to wait for two years, so we decided on the medical doctor. He was more humble. He was a very humble man and a very good man. The missionaries rented two apartments in his house. He was single and he was a great musician, he would often have concerts and go abroad because of his business with music. He started the translation and finished 1-2 Nephi and had just started Mosiah. It took 2.5 years and we were getting worried because the missionaries needed the Book of Mormon and they needed it badly. Then a man came from the translation office in Salt Lake, Ed Davies. I had a meeting with Ed Davies and the one missionary couple in Iceland. Our branch was young, there were very few members. We had a meeting and decided that we couldn’t wait, something had to be done. Ed Davies from Salt Lake told us that the Church had published a shorter version with excerpts from the Book of Mormon, the parts that were most important, that the missionaries would use most. There would be no index and no footnotes, just a simple publication. We could use those chapters that had already been translated and I could help him with the rest of it—it would only take one and a half years. We were very excited about that. Davies was taking a plane from Iceland to Frankfurt and he would be in Salt Lake City in a few weeks and he would ask about this and let us know. I received a letter a few weeks later letting me know that it had been agreed that we could do this simple publication. The only thing that was needed was my written agreement. So, I was going to write a letter. I was so excited, I told Doctor Hansen that I was going to write my letter right away. But the strangest thing happened when I put the paper in the typewriter. I started but then I had this strange feeling that this was not what the Lord wanted. I didn’t know why. So I knelt down in my office and I prayed. I told the Lord in my prayer (like He didn’t know) that we needed this book so much, the missionaries needed this so badly. I had a strange and empty feeling that it was not right. I didn’t get any answer to my prayer, so I decided to wait two to three days to think about it, ponder about it, and pray. I did. I prayed about it a lot. I didn’t understand why. So, on the third day I decided to pray again. I had an office across the street from the big Lutheran church in Reykjavic. Our church was on the same street, just around the corner there. And there was great traffic always on that street. My window came up to the floor almost. There were people walking and cars passing. I was talking to God about it: please give me an understanding, something so I can feel better about it. Nothing more, just these mild, very clear words,. Then it stopped and the noise came back through the window, but I was dazed. I didn’t stand up from the prayer right away, but then I sat down at my typewriter and wrote down my experience. I told them I was sorry but I couldn’t give my approval, because I felt—I didn’t feel, I knew—I knew that wasn’t what God wanted, for us to work on this temporary work. He wanted us to work on the Book of Mormon. I ended by saying I only could promise what the Lord had promised: that the translation of the Book of Mormon would be finished this year. When I typed that down I thought, what on earth am I doing. This cannot be done, this is completely impossible. I called Doctor Hanson and told him I didn’t give my approval and told him why, and I said to him that I was sorry. I told him the translation would be finished this year. But how would it be done? He said, that is for you to find out. I started thinking, pondering and praying—and those words I had heard, the last ones, had been very strong: “If you are willing to work hard.” If I was willing to work hard. I thought the only way I could help finish it was to do the translating myself, alongside Dr. Hanson. The more I thought about it, the more I thought that was the right thing. I went to Dr. Hanson and told him I had promised that the translation would be finished. He was very quiet and mad. And he jumped up from his chair and said, “That is impossible.” He was just beginning the first chapter of Mosiah. So I told him what I was thinking and what I felt and that I would be translating with him. He had already translated 1-2 Nephi and the short books. I had reviewed it and I knew how he had translated the special language, because I had previewed it. I had by then translated a big part of the Doctrine and Covenants. He was very happy with the solution that I would also be translating. So we needed to divide the rest. I thought it was wrong to divide by books, because there were different authors. So, we divided it as we thought best. I started translating too. I had all day—he was working full time and going abroad with his music. So we did the rest of it. And it was finished. Did you gain appreciation for Joseph Smith through your experience as a translator? It came easy to me, how to say the things. I checked on how Dr. Hanson translated and then would remain consistent. Is that the version they use today? When we were translating the Book of Mormon we didn’t have any help, but later, about 1985 or 1986, the church had a translation guide and a lexicon. The translation guide had almost every verse and an explanation for every word—whether it was singular or plural and what it particularly meant. So the translation had to be checked and changed. I had two men in the Church help me. They read over what I decided to do. They marked down what they thought might be better. There were some changes. I worked on that mostly, those men just helped. Then we had three members review the Book of Mormon and another three members review the Doctrine and Covenants and Pearl of Great Price. How did translating increase your testimony of the Book of Mormon? It did strengthen my testimony. Every time I open it, it strengthens my testimony, every single time. I remember when I was finishing the translation, I remember that I didn’t want it to end. It was so wonderful to work with it. It is so wonderful to work with scriptures. It is so wonderful to work on the word of God. Marital History: Married 3 times. Currently widowed for 15 years. Occupation: Office clerk; translator for The Church of Jesus Christ of Latter-day Saints.